A pair of researchers with the University of Washington has found that an increase in wildfire size and duration over the past 28 years has led to worsening bad air days in the U.S. Northwest. In their paper published in Proceedings of the National Academy of Sciences, Crystal McClure and Daniel Jaffe describe their study and what their results mean for people living in affected areas. 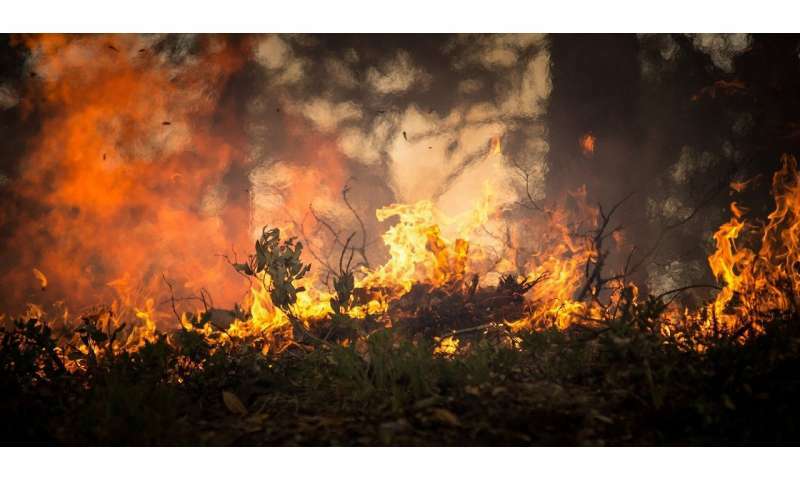 Over the past quarter-century, wildfires (unplanned fires burning in forests or other areas) in many parts of the western United States have become larger and longer-lasting than they were in earlier years. Many environmental scientists have suggested this is due to global warming. Prior research has shown that such fires carry fine particulate matter into the air, and that many people can be harmed by breathing such particles. Those with lung conditions such as COPD or asthma, for example, can suffer problems when exposed to such particles, as can senior citizens and children. In this new effort, McClure and Jaffe looked into the possible impacts of bigger and longer-burning wildfires on people living in impacted areas. They obtained data from 100 rural air quality monitoring sites from across the country and sifted through the data, collecting information only on particles that were smaller than 2.5 micrometers. They entered the data into a mapping application that displayed levels of such particulates across the continental U.S. Next, they set filters to show changes in levels of the fine particulates over the years 1988 to 2016 for only the worst air quality days. Doing so showed that the northwest part of the country has experienced more bad days over the past 28 years, and those bad days have been worsening. In sharp contrast, they found that the rest of the United States experienced better air quality over the same time period. The researchers note that even people who are not normally at risk from wildfire particulates can be harmed if they are exposed to them on a regular basis. And sometimes, levels can be extreme, such as when a fire burns for a long time near a community. Using data from rural monitoring sites across the contiguous United States, we evaluated fine particulate matter (PM2.5) trends for 1988–2016. We calculate trends in the policy-relevant 98th quantile of PM2.5 using Quantile Regression. We use Kriging and Gaussian Geostatistical Simulations to interpolate trends between observed data points. Overall, we found positive trends in 98th quantile PM2.5 at sites within the Northwest United States (average 0.21 ± 0.12 µg·m−3·y−1; ±95% confidence interval). This was in contrast with sites throughout the rest of country, which showed a negative trend in 98th quantile PM2.5, likely due to reductions in anthropogenic emissions (average −0.66 ± 0.10 µg·m−3·y−1). The positive trend in 98th quantile PM2.5 is due to wildfire activity and was supported by positive trends in total carbon and no trend in sulfate across the Northwest. We also evaluated daily moderate resolution imaging spectroradiometer (MODIS) aerosol optical depth (AOD) for 2002–2017 throughout the United States to compare with ground-based trends. For both Interagency Monitoring of Protected Visual Environments (IMPROVE) PM2.5 and MODIS AOD datasets, we found positive 98th quantile trends in the Northwest (1.77 ± 0.68% and 2.12 ± 0.81% per year, respectively) through 2016. The trend in Northwest AOD is even greater if data for the high-fire year of 2017 are included. These results indicate a decrease in PM2.5 over most of the country but a positive trend in the 98th quantile PM2.5 across the Northwest due to wildfires.